China has a long tradition of agriculture production. Millet crops including foxtail millet and broomcorn millet were first domesticated in North China. Tthereafter, the development of millet-based agriculture (also called "rain-fed" agriculture) provided an important foundation for the emergence of ancient Chinese civilization, which might have also exerted unprecedented impact on natural environments. Previous studies revealed that the Yangtse River valley of south China and the Yellow River valley of north China were the original center of rice agriculture and rain-fed agriculture respectively. The history for the development of rain-fed agriculture during Neolithic period is important, as central North China was the cradle for the origin of ancient Chinese civilization in early 4th Millennium BP (Before present). Archaeologists summarized the timeline for the development of rain-fed agriculture in Neolithic China based on archaeobotanical evidence. While the space variation in this process has not been adequately studied, the spatial-temporal intensification and expansion of rain-fed agriculture in the Neolithic Age has not been clarified. 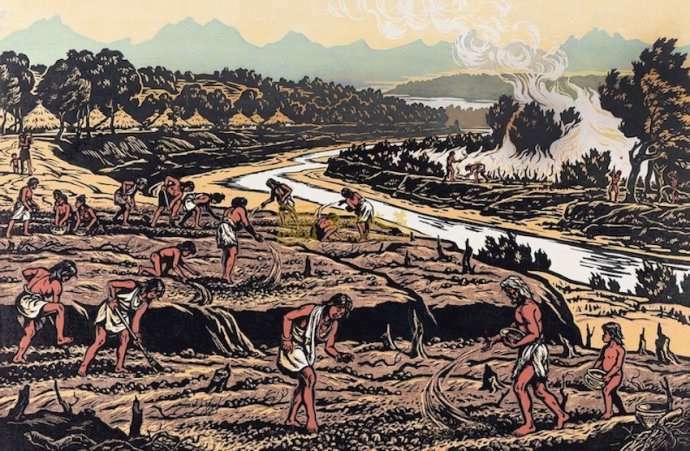 Whether human behaviors of slash-and-burn cultivation had significantly and extensively affected their surrounding environments after the emergence of intensive rain-fed agriculture has also not been well understood, due to the lack of interdisciplinary studies—for example, the cross-over studies between archaeology and earth sciences. The issue is valuable for the controversial discussion of the Anthropocene, which has been nominated as a new geological epoch. Some scholars argue for an onset of the Anthropocene between 1945 and 1964 AD, when intensive atmospheric nuclear testing resulted in the peak values of 14 degrees C that is widely recorded in tree rings and sediments; other scholars argue that its beginning may be traced back to the early Holocene. This latter argument is related to the beginnings of significant landscape modification through the development and spread of agricultural practices in old world since 10,000 BP. In an article coauthored by Guanghui Dong, Shanjia Zhang, Yishi Yang, Jianhui Chen and Fahu Chen, scholars at MOE Key Laboratory of Western China's Environmental System, Lanzhou University, the intensification and expansion of agriculture during Neolithic Age in Northern China and its imprints in paleo-environmental records has been detected based on the comparative analysis of multidisciplinary evidences. These five scholars review the results of archaeobotanical and dating studies, and carbon isotope analysis of human bones from Neolithic sites. They compare them with black carbon content from palaeoenvironment records in Northern China. Based on these works, they conclude that millet cultivation was an auxiliary subsistence strategy in Northern China from 10,000 to 7000 BP; while hunting-gathering was the primary subsistence strategy, the earliest millet-cultivation might have emerged in eastern Inner Mongolia post 7700 BP. Millet cultivation transited from a secondary strategy to become dominant in the Guanzhong area of north-central China during 7000-6000 BP, and probably facilitated the development of early Yangshao culture in the middle reaches of the Yellow River valley. Intensive millet-based agriculture emerged and widely expanded across the Yellow River valley in northern China during 6000 to 4000 BP. This promoted rapid population growth and cultural evolution in the late Neolithic period, and was key in the subsequent emergence of the ancient Chinese civilization. The temporal-spatial variation of black carbon (EC-soot) corresponds well with the intensification and expansion of millet-based agriculture during Neolithic period, suggesting intensive millet agriculture production activities exerted evident impact on fire frequency in northern China. This work provides a valuable case study for understanding the temporal and spatial development of millet agriculture, and human-environment interactions in northern China during Neolithic period from an Anthropocene perspective. How did prehistoric humans occupy the Tibetan Plateau?